Bruce Marcus has been a distant mentor since I began following his writings in 1990. 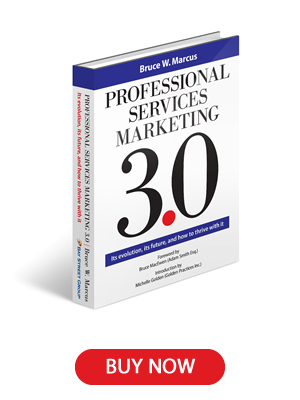 In Professional Services Marketing 3.0, Bruce takes us on a remarkable journey from Marketing 1.0 to 3.0, dissecting all the concomitant changes taking place in the marketplace. Like a master cartographer, he maps out the forces of Marketing 3.0 that will change the professions—most importantly, from being practice-centric to becoming client-centric. Because the purpose of any enterprise is to create a customer, marketing and innovation are the only functions that matter, as they create results, whereas all the rest are merely costs. Read this brilliant work to learn how to perform both of these functions more effectively in an environment dominated by creative change. Throughout his extraordinary career, Bruce marcus has been teaching us to grasp the fundamental unchanging truths of professional marketing even as we respond to the inevitable changes and challenges that expanding marketplaces dictate. Professional Services Marketing 3.0 is a wise study of where we are now, how we got here, and where we need to go next. Here, simply, is the voice of a master. This book is a must-read for those interested in what the future holds for professionals seeking growth in this new millennium. Timely, relevant and focused.